Reading Performing Under Pressure took much longer than I had planned, and absorbing it took even longer. The book is information-dense, but in the end, I think worth the effort. Based on the latest research, Dr. Hendrie Weisinger and Dr. J.P. Pawliw-Fry re-examine many popular beliefs about pressure and offer concrete solutions for dealing with it. 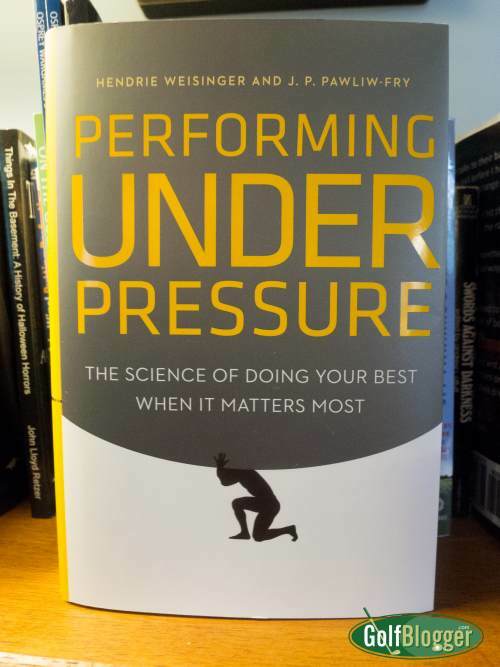 Although there are many who believe that certain people (perhaps themselves) perform better under pressure, the Doctors present solid research that this is just not the case. Pressure invariably causes poor judgment, wavering attention, declining coordination and diminished performance. Athletes who appear to get “better under pressure,” are not — they are just managing the pressure better than everyone else on the course. And that’s the key: managing the pressure. In this advice to his son, the father speaks not of superior performance in tough situations, but of dealing with what is thrown at you with calm and grace. In the first third of the book, the Doctors offer a primer on the nature of pressure itself: how it affects our bodies and brains, what constitutes “choking,” and the mental traps that lead to the feelings of pressure. The second section of Performing Under Pressure offers twenty two strategies for dealing with the ravages of pressure. such as downsizing the importance of a moment, and recalling times when you had previously managed to do your best. Finally the authors offer a formula for a “Cote” of armor against pressure: Confidence, Optimism, Tenacity, and Enthusiasm. My one criticism of the book may actually be seen as a strength by others. For my tastes, the authors offered too many examples and stories to illustrate their points. As a teacher, I understand the impulse to offer sufficient concrete material to encourage understanding of abstract ideas. At some point, though, you need to trust your learners and keep the ideas moving. While Performing Under Pressure is not golf-specific, most of the advice can be applied to adventures on the course. Whether it is contending in a club championship or facing the prospect of breaking 90 for the first time, unmanaged pressure can keep you from your golfing goals. More than that, though, the advice in Performing Under Pressure can be applied to situations created by family and work. In this 24/7 world, everyone faces enormous pressures that, left unchecked can lead to ever decreasing effectiveness — and happiness. I am going to put more than a few of the bits of advice into play as the new school year begins.